Cost per night 25 Please note prices are just a general guide. We are situated in the beautiful Goomburra Valley, approximately 2 hours west from Brisbane through Cunningham’s Gap and about an hours drive south of Toowoomba, nestled in the foothills of the Great Dividing Range, and just a short drive to the Main Range National Park, Goomburra Section. 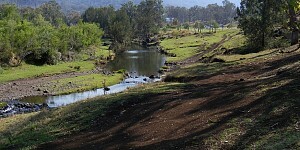 The property consists of approximately 1000 acres, mostly comprising of hilly terrain and rocky gullies, with a well grassed area for camping grounds, beside a flowing creek. There are septic toilets, hot showers, rubbish bins, picnic tables and potable water on tap for clientele use. We have only been open since April 2004, and we have established approximately eighty, 4 WD tracks,rated from easy, medium, difficult and extreme. Please note, that we have a buddy system in operation at the park, which means that you may only enter if accompanied by at least one other vehicle, (this is for 4 Wheel Driving purposes only). 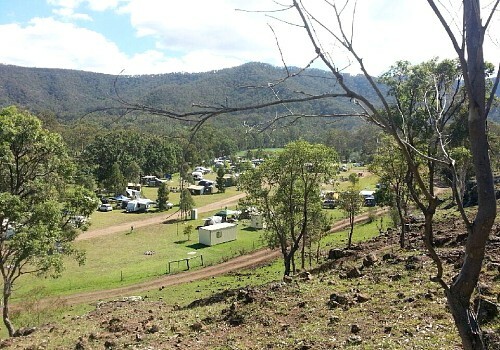 The camp grounds are also accessible to 2WD vehicles, and caravans are also welcome. 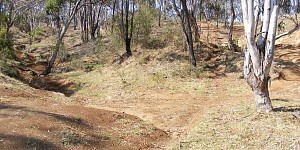 Sorry, no motor bikes are permitted on the 4wd tracks. A new camp ground was opened in early 2007, with a large shed with more toilets and showers and a open entertainment area for club or group functions. We are now able to cater for meals for parties, weddings and other functions. Roast Dinners, Pig on a Spit, or just a Bar- B -Q, with a range of salads & vegetables are available. A large selection of desserts are also included with the meals. Please note a minimum of 15 persons are required to make a dinner booking. Spit roasts require a minimum of 40 persons. We are planing on setting up some cabins in the future, they will have mains power, air-conditioning and satelite TV. Please Note:- Even though we are a 4wd park, we welcome campers only. Caravan Clubs are now welcome as we have only recently installed some powered sites. There are no vehicle fees for 2wd’s, if you camp over. However there is a 2wd fee for day vistors of $15. There aren't any reviews yet for Janowen Hills. Great park for camping and four-wheel driving. Good amount of tracks with different varieties of difficulties. Definitely wanna go again.